This week, we have a little Cajun, a taste of Africa and straight up American cuisine to grace our Sunday dinner table. Heat olive oil in a sauté pan; add garlic and spinach and sauté just until spinach wilts. Immediately remove from heat and let it cool down as quickly as possible. Combine salt, granulated garlic and black pepper in a small vessel then sprinkle it on the salmon inside the pocket and outside rubbing it in. Place salmon in a lined or oiled sheet pan, open the pocket and line the bottom half with the spinach then add a layer of the roasted peppers, close the salmon flap. Place the salmon in the preheated oven and roast 20 – 25 minutes and no longer. If you want it browned, place it directly under the broiler 5 minutes prior to the elapse of the cooking period. Salmon will continue cooking anywhere from 8 - 10 minutes after it is removed from the heat, so let it sit undisturbed until cooking process is complete. Slice squash in half lengthwise, then slice on the diagonal. Heat a medium skillet on medium high heat. Add the oil and heat. 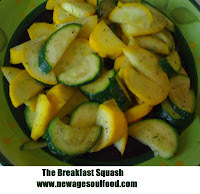 Once oil is hot, add the squash, salt and pepper, mix thoroughly. Saute approximately 6 minutes or until squash is tender but not over cooked mushy). Remove from heat, serve hot. Sort beans by spreading them out on a flat surface and remove any broken, off color or odd shaped beans. Remove any dirt, rocks and other debris. Rinse thoroughly in cold water, drain and set them aside. In a large pot, heat the oil and sauté the peppers, onion and garlic until onions are translucent. Add the water, beans bay leaves and seasoning, stir and cook uncovered, over medium heat stirring occasionally. 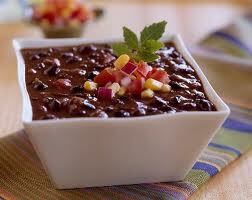 Cook for 2 hours or until beans are fork tender. Check the liquid level and make sure it’s covering the beans by at least 1 inch while cooking. If liquid is evaporating too rapidly, reduce heat and add water ½ - 1 cup at a time. Angelique: Welcome to Sunday dinner! I hope we've been giving you some great new ideas in the kitchen. Mom: Moms grab your daughter and start planning tomorrow's dinner. Angelique: And sons too cause they need to learn to cook especially since a lot of girls aren't. Mom: True. Gather the kids, teach them some cooking skills and enjoy a nice Sunday dinner which this week has some fun stuff. Angelique: She's talking about the couscous. I don't even know what that stuff is. Mom: I don't know how to tell you this Princess, but it's nothing but pasta. Angelique: Doesn't look like pasta to me. Mom: Well it is! It's ground pasta that you don't even have to cook. It's instant. Just add boiling water or juice, season it, add fruit or nuts or fresh herbs and voila you've got a delicious grain. Angelique: Well I do like the instant part. 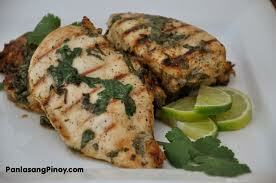 In a small bowl, whisk together the juice, cilantro, garlic, olive oil, salt, onion powder and chili peppers. Preheat grill on medium heat, and oil grate. 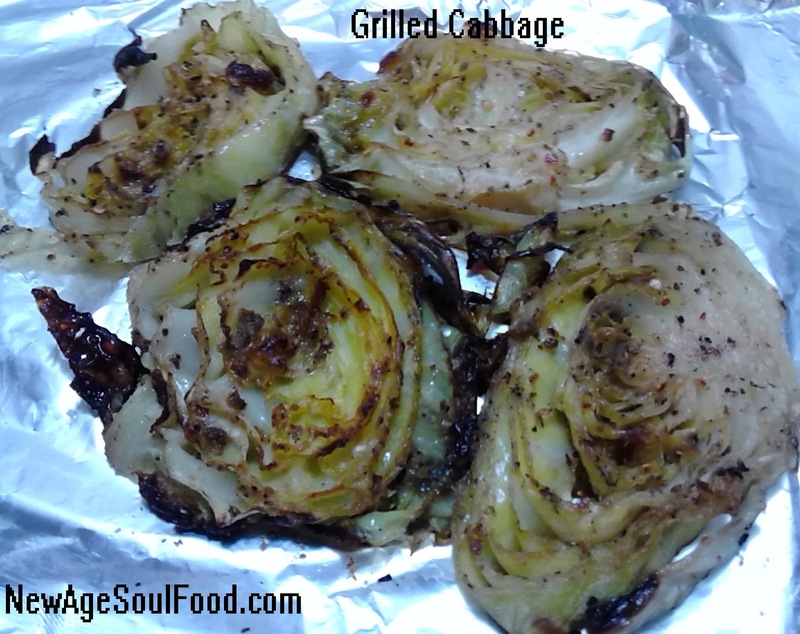 Place cabbage, onion and pepper on grill and grill just long enough to get grill marks on each side. 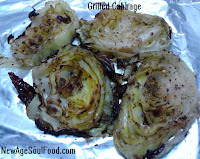 Remove vegetables from grill and place on a large sheet of aluminum foil. Sprinkle with pepper, salt, granulated garlic, tarragon/dill and drizzle with oil. Fold edges of foil together to seal, then wrap entire package again with another sheet of foil. Cook on hot grill 20 - 30 minutes, turning packet every 10 minutes. Note: The vegetables can also be baked in a 450 degree oven until browned. Place orange juice in a sauce pan and bring to a boil. Select a bowl with a lid that can with stand boiling water. 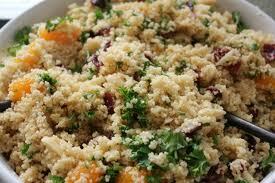 To the bowl, add couscous, olive oil, salt, pepper and cranberries and mix thoroughly. Add orange juice, mix thoroughly, cover and let it sit undisturbed 16 minutes. 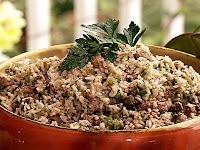 Once the 16 minutes has elapsed, add the mandarin oranges, almonds and parsley mix thoroughly. Prepare a large bowl of ice and water (ice bath) and set aside. Place a medium pot of water on the stove and bring it to a boil. Wash and snap beans in half or thirds. Place the beans in the boiling water. Let the beans boil for 1 minute then immediately remove from the heat and drain. Place the green beans in the ice bath to cool them down quickly. While beans are chilling, cut the corn off the cob and place the kernels in a large bowl with a lid. 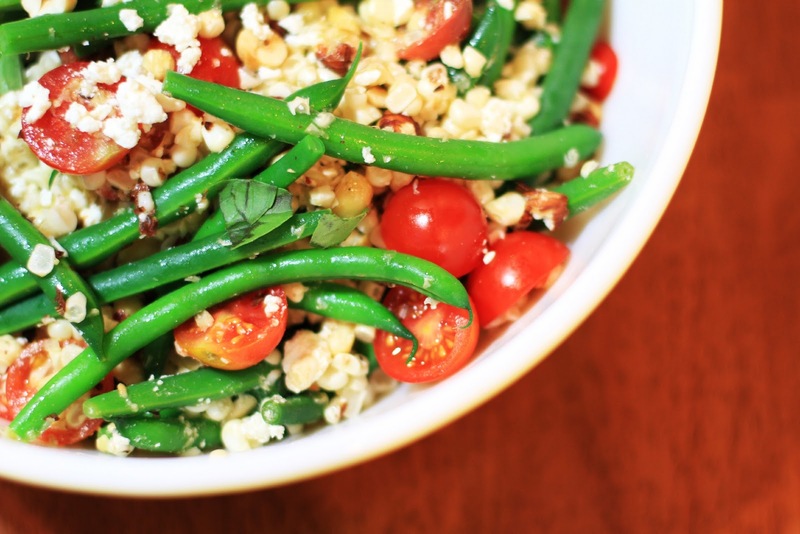 Wash and cut the cherry tomatoes in half and add them to the bowl along with the onions, chilled green beans and feta cheese. Cover and refrigerate. 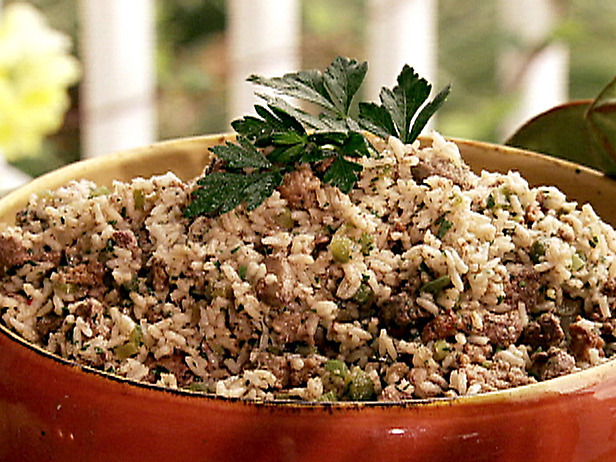 In a small bowl, thoroughly whisk together the ingredients for the dressing. Pour ½ of the dressing over the salad add the basil and mix thoroughly. Refrigerate at least 1 hour prior to serving. Add the remaining dressing, if needed at time of serving.